Greetings from the backwoods of Maine, where a bowl of wild Maine blueberries sits beside me, a soft snow is falling on Long Pond, and the day holds the promise of a snowshoe expedition up to Third Mountain. I have joked that in 2012 I was in “the flux,” transitioning through the ether from one thing to something. What that was though, I didn’t know. Now is it 2013, and I am happy to announce that I have left the haze and have landed as a chef at a lodge in northern Maine. 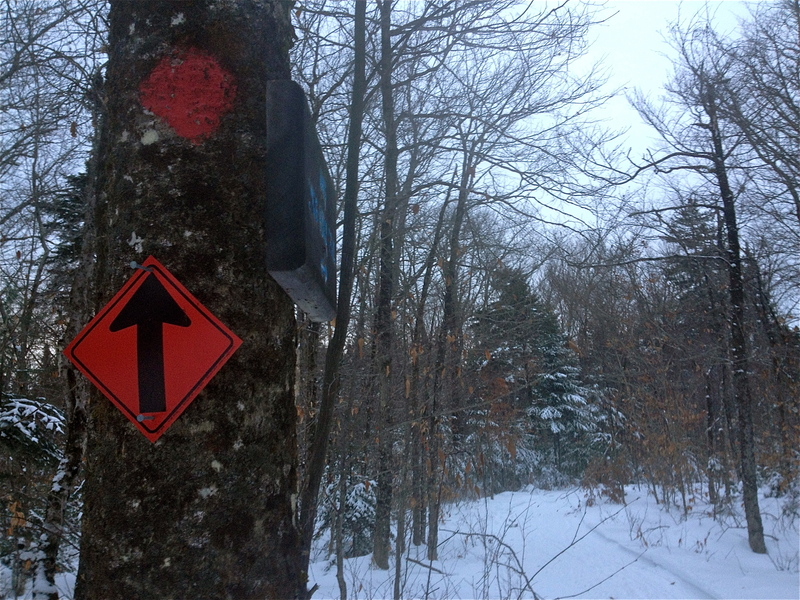 Our guests either snowshoe, cross-country ski, or catch a snowmobile ride in eight miles to reach us. For their effort, they are rewarded with a hearty dinner that evening, breakfast the following morning, and a good reason to consume baked goods to their hearts content. During my first 48 hours here I made; five dozen dinner rolls using my Mimi’s recipe, fifty chocolate chip cookies, four dozen vegan blueberry coconut muffins, three dozen cranberry pecan scones, banana cake with lemon cream cheese frosting and raspberries, a vegan gluten-free raspberry cobbler, a load of onion chive cornbread, vegan pumpkin spice cake, four loaves of italian garlic bread, six dozen vegan oatmeal raisin cookies, and just short of a hundred pancakes for good measure. Looking back through the cloud of flour left from this baking whirlwind, I’m happy to report that it was done in true cookingscraps style. For the first dinner on Friday night, tasked with making cornbread and cookies quickly, I turned to the Moosewood Cookbook for the bread and Cooks Illustrated for their Thick & Chewy Chocolate Chip Cookies– two of my favorite recipes. The next morning, the banana cake came out of needing to use a crate of over-ripe bananas. We ran out of eggs, so I found some excellent vegan desserts and experimented with substitutes for eggs. I’ve made recipes I’ve had my eye on for years, old standbys, family favorites, and come up with brand new dishes. I’ve also learned how to cross-country ski and drive a snowmobile (not at the same time! 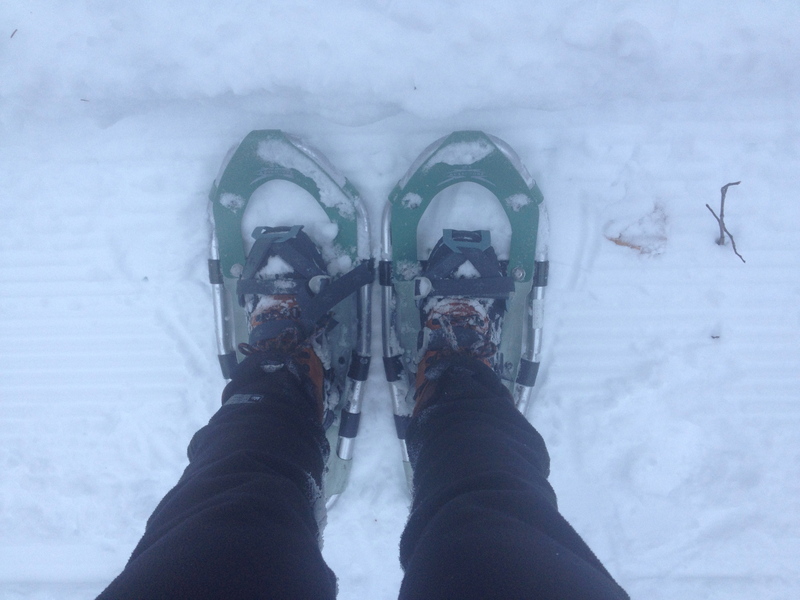 ), fit in a few snowshoeing treks, spotted moose tracks, and made new friends. In short, it has been everything I hoped for and more. This past week I have continued to cook up a storm for guests. I finally learned how to make caramel and gnocchi from scratch. Some particular successes have been a stuffed pepper soup, a shockingly good riff on this hazelnut and squash lasagna, and a carrot-lemon brown rice to go alongside coconut milk marinated pork. The staff here likes leftovers as much as I do, and I am happy to see them happily reheating them for lunch the next day. One of the staff favorites has been my apple crisp, so much so, I’ve made it twice this past week. I’ve been thinking about it after someone mentioned a recipe for a bourbon bacon brownie. To go through all the effort, and expense, to produce such a brownie- it better be earth-shatteringly good, and usually it isn’t. Who invited bacon to dessert, anyway? If you spend time focusing on just making a really good brownie, not only will it suffice, but it will shine. In the spirit of that conversation, this is my really good apple crisp- or perhaps it is a crumble, but I’ve always called it a crisp. 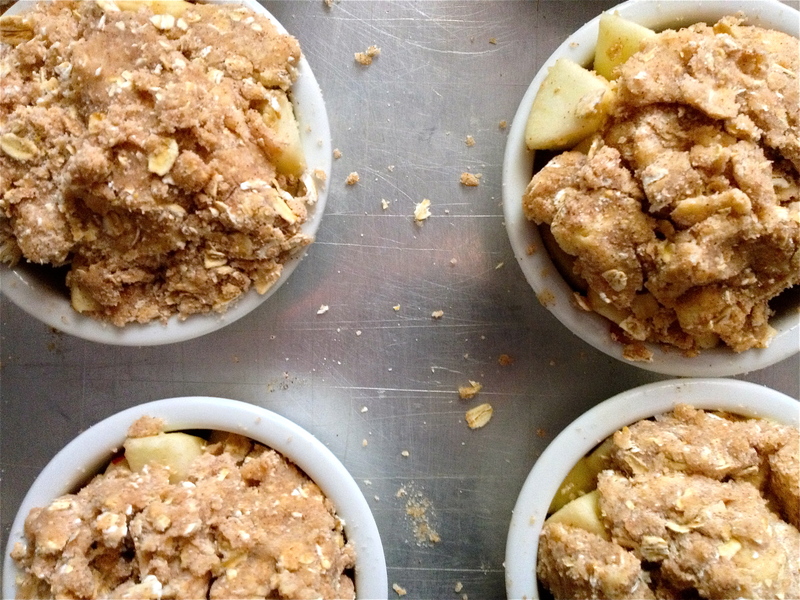 It is simply tart apples with a generous sweet oat topping. It is good anytime really, warm out of the oven, or cold out of the refrigerator the next day; however, around these woods, you better get to the kitchen early, as it hasn’t been lasting long. Preheat the oven to 375ºF. Peel, core, and dice apples into one inch-ish chunks (or leave them in slices, just don’t make them too thin). In a 9×9* square baking dish (8×8 is okay too, no one has ever complained about a thicker crisp! 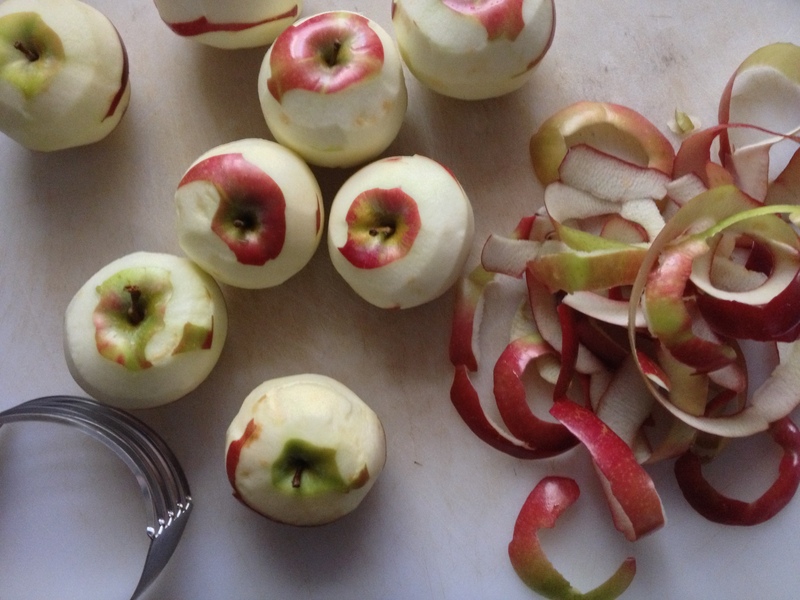 ), toss apples with brown sugar and lemon juice. In a medium bowl, mix together the remaining dry ingredients. Add the butter to the dry ingredients, and using your hands or a pastry blender, incorporate them until the mixture forms coarse clumps- no smaller than peas, you want to be chunky. Cover the apples with the butter mixture, packing it on top. Part of what makes it so good is that this recipe has double the topping than most recipes. Bake for about 50 minutes, until apples are tender and the top is golden brown. I like it plain; however, it was happily devoured with barely sweetened whipped cream and/or vanilla ice cream by several crew members. Serves 8-10 people. *The second time I put it into eight small ramekins for a slightly more elegant presentation for the guests.